What do charcoal masks, clay masks and mud masks have in common (besides scaring your significant other when you exit the bathroom)? They’re detoxers. They all deep clean without over-drying, calm both acne and redness, and give you a healthy glow—all in one (messy) step. 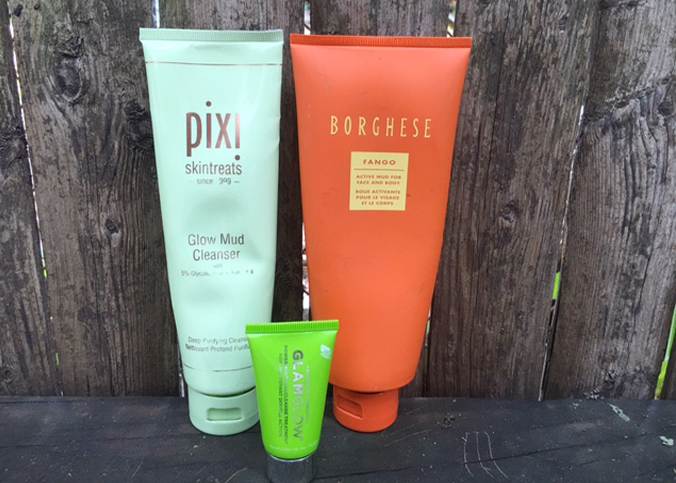 Pixi Glow Mud Cleanser – This active yet gentle cleanser with 5% glycolic acid exfoliates while the mud deep cleans and detoxifies pores while hyaluronic acid, aloe vera, and avocado oil. 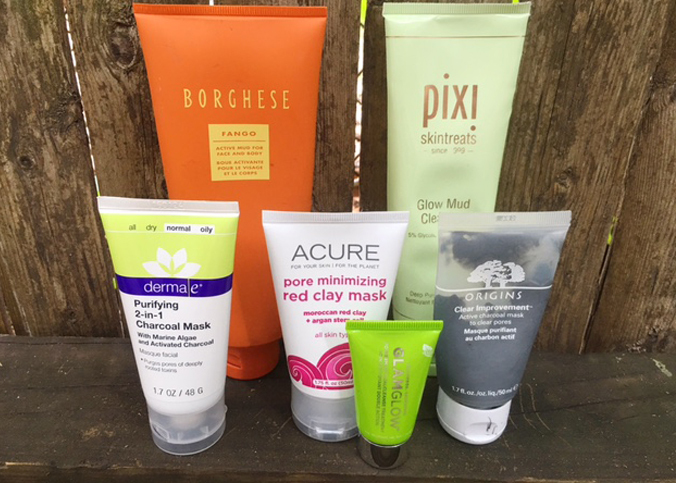 The cleanser is best used for pore cleansing and has a light aloe scent that isn’t overpowering. How To Use: Apply a coin size amount to damp skin, massage gently for 30 seconds, rinse clean & pat dry. I’ve found that for best results, follow with Glow Tonic. GLAMGLOW Power Mud Dual Cleanse Treatment – The dual cleanse treatment has a mud-to-oil formula for deep cleansing with gentle results. How it works: Oxilier, a custom complex of four powerful deep cleansing oils, enables the formula to absorb quickly while remaining nongreasy; Claytox, a carefully balanced four-clay blend, gently detoxifies skin; and patented Teaoxi technology helps nourish skin while you cleanse. How To Use : Apply an even layer to a clean, dry face, leave on for 5-10 minutes, and gentle remove with warm water using a circular motions to transform into a cleansing oil treatment. For best results, use once or twice a week. Borghese Fango Active Mud for Face and Body – Infused with Sweet Almond and Avocado Oils, this mud detoxifies and does away with dull skin, minimizes pores, and tones texture. The best part (and that I’m willing to admit I didn’t know until recently) is that it can be used all over your body too. How To Use: Apply a ample amount on face and/or body and let dry for 2-3 minutes and rinse with warm water. Origins Clear Improvement Active Charcoal Mask – Origins’ Charcoal Mask is one of my regular go-to’s (as evident by the photo above). Living in NYC with high levels of pollutants, I find myself using it 2-3 times week. The activated charcoal acts like a magnet to draw out pore-cloggers, while white china clay absorbs environmental pollutants, lecithin dissolves impurities. How To Use: After cleansing, apple a warm towel over your face to open pores, apply a generous layer of mask, leave on for 10 minute and rinse. 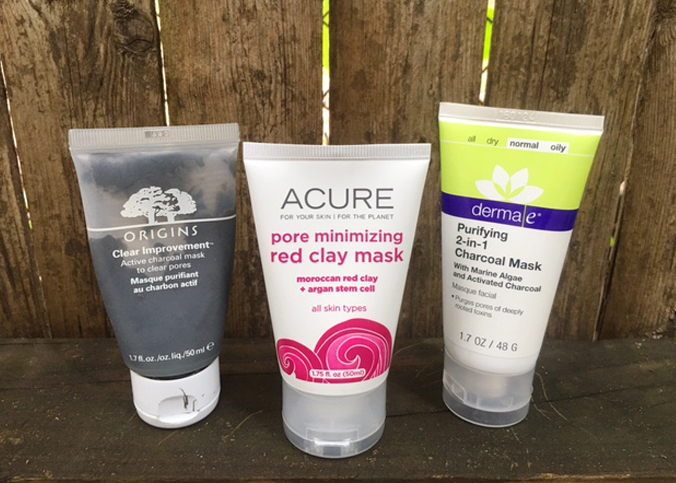 (Vegan) ACURE Pore Minimizing Red Clay Mask – The perfect mask to boost your skin’s glow, ACURE’s Pore Minimizing Mask utilizes Moroccan red clay, which is rich in nutrients and helps draw out impurities, while argan stem cells hydrate and tone. With the scent of blueberry, chamomile, rose, coconut and lemon, this clay mask is more like a sensory spa experience than any others in my arsenal. How To Use: 1-2 times a week, apply a thin layer to face, neck and chest, allow it to sit for 15 minutes and rinse well. Derma E Purifying 2-in-2 Charcoal Mask – Purifying 2-in-1 Charcoal Mask deeply detoxifies skin of harmful micropollutants in two ways: (1) Natural clays infused with Kimarine® Wakame, Bladerwrack and Activated Charcoal lift out dirt, oil and bacteria to decongest pores as the mask dries; (2) Apricot Seed Powder exfoliates away dead skin cells and captured debris upon removal. Kaolin and Bentonite Clays absorb excess oils and impurities, relieving skin congestion. How To Use: Apply generously to a clean face, leave on for 5 minutes or until mask is completely dry, moisten fingertips, then massage mask gently in a circular motion to activate exfoliants, concentrating on areas of congestion such as nose, chin and forehead, then rinse thoroughly, or remove with a damp cloth.